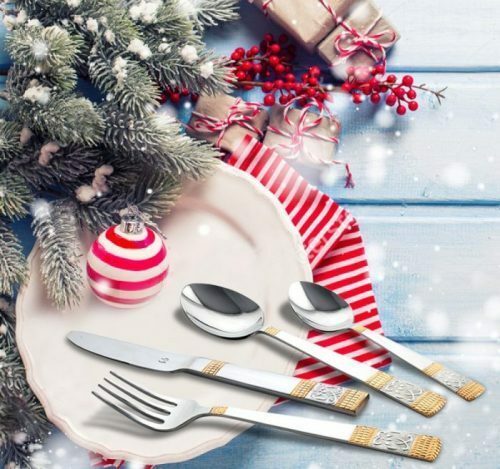 BASK IN A CUTLERY-SQUE CHRISTMAS-NEW YEAR EVE! Yes, it is that time of the year! It is the time we patiently look forward to, to sit and jot down new resolutions trying to shake -off old clutter and bask in the joy of new possibilities. Festivity is at its peak and home-coming of guests is on the cards. It is all “lay the table, spread the cheer” and, fill your homes with new accessories as well as gifts for each other. The spell of monotony breaks here as we look towards prepping up for a new year along with the joy of Christmas. While we set off to part with the old and embrace the new, why not start with a sneak-peek at the kitchen and dining; starting with the best mood-lifter which is food and partying: that is not possible to begin with without opulent kitchen wares, accessories and fine dine cutlery. Although not enough credit is given to opulence in the kitchen –dining, we all know it that it is undeniably important and a significant source of grace, sophistication and joy! Ask the home-makers and party hosts! It is the stately charm of the classy cutlery pieces categorized into series such as Dorato, Bianca, Jasper, Madrid, Venice, Gemini, Galxy, Imperio, and many others. All the series carry a distinct feature of individual charm and sophistication, a hallmark of quality using FDA standard Steel, some also with 24 karat gold plating and many varying design narratives. There is a gamut of kitchen accessories, kitchen tools and wares: providing an opulent, efficient and ergonomically crafted range of kitchen- dining series. Dabble in your own signature cutlery couture as you find a host of kitchen-dining options to choose from, selecting the pieces which you find a sense of familiarity with, as well as spread Christmas cheer by gifting these opulent wares to your loved home-makers. Listen to the clanking of the glasses, chimes of flatware, while bells jingle and winter sits inside your living room joining the party already!